Belgium's inflation rate based on the European harmonised index of consumer prices (HICP) was running at 2.2 % in March compared to 2.0 % in February. Core inflation (inflation without energy and unprocessed food) stands at 1.5 % in March. The inflation rate based on the consumer price index (CPI) for March stood at 2.3 % compared to 2.2 % in February. The sub-indices with the largest upward effect on inflation were electricity, motor fuels, domestic heating oil, travels abroad, tobacco and gas. The sub-indices with the largest downward effect on inflation were housing rent, meat, telecommunication and clothing. The harmonised index of consumer prices of March for the EU Member States will be published by Eurostat on 17 April. Do you need open data? Since the start of the millennium, the European economy has evolved and statistics can help to better perceive these structural changes. 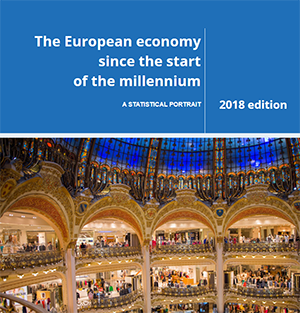 This digital publication The European economy since the start of the millennium — a statistical portrait aims to show how main features of the economy of the European Union and its Member States have evolved since 2000 through a large range of statistical data giving both a micro- and a macro-economic perspective. This publication does not describe the short-term trends of the European economy, but its purpose is to answer questions such as: How has our consumption behaviour changed? How has household income evolved? Are working patterns still the same? What is the share of services in the economy? What is the proportion of large enterprises? Has government employment increased or decreased?